Everybody loves a good Cinderella story. There’s something about seeing the underdog prevail that gives people hope a fairy tale ending is actually possible. When the top four collegiate chess teams come together in New York City in April, a champion looks to repeat while an unlikely contender hopes simply to keep the magic going. It’s no surprise that Webster University dominated the Pan-American Intercollegiate Team Chess Championship, held Dec. 27-30 at Texas Tech University in Lubbock. After securing the President’s Cup in Washington, D.C., last year, the reigning champions once again flexed their collective chess muscles to finish in clear first place, scoring a perfect six points out of six rounds at the Pan-Ams. This performance earned the Gorlocks a berth into the Final Four and a chance to defend their title as national champions. From left: Xin Luo, Eric Rosen, Michael Auger and Akshay Indusekar hoist the third-place trophy at the Pan-American Intercollegiate Team Chess Championship. This year, however, the belle of the ball showed up with war paint on. The Fighting Illini from the University of Illinois defied the odds and 41 other teams to earn a spot in the Final Four as well. This result is especially impressive given the average rating of the team heading into the event placed them 13th overall. 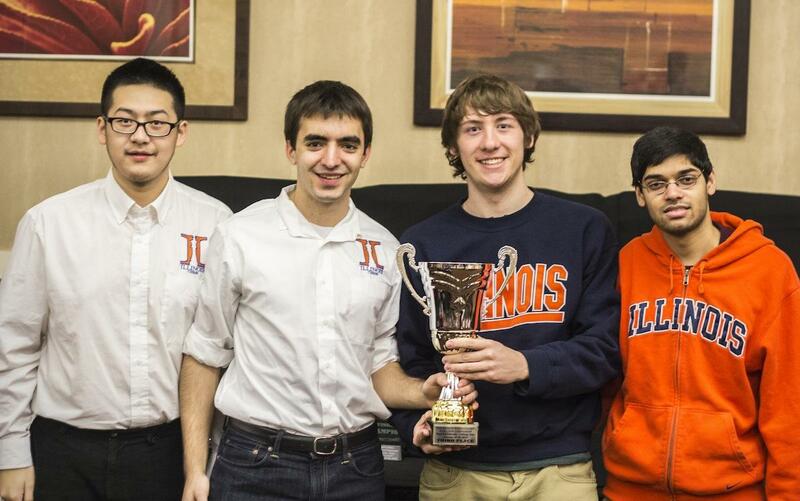 Led by sophomore Eric Rosen, 20, of Skokie, the University of Illinois upset three much stronger teams in the final three rounds including Columbia University, Lindenwood University and Texas Tech’s B-team en route to a third-place finish overall in the event. “I wasn’t expecting to upset so many good teams along the way,” Rosen said. If this Cinderella story seems familiar, it’s because the Fighting Illini did the exact same thing last year, when Rosen was a freshman. Seeded 13th out of 44 teams, Rosen and his teammates scored upset after upset to qualify for the Final Four for just the second time in school history. (The University of Illinois had last qualified for the Final Four in 1991). The fairy tale story is all the more surprising because the University of Illinois has just about no organized chess program. No scholarships. No grandmaster coaches. No billboards on highway 70 trumpeting their success. Many of the other top schools, including perennial powerhouses like the University of Texas – Dallas; University of Texas – Brownsville; Texas Tech; University of Maryland – Baltimore County (UMBC); and newcomers like Lindenwood University and Webster University, offer scholarships for chess players and feature grandmaster coaches, if not full time, at least on a weekly basis. When Rosen got to school his freshman year, there was nothing but a loose collection of students that met once a week. Rosen had already demonstrated his abilities as a top junior player, having competed at the U.S. Junior Closed Championship in 2010 and 2012, and his long-time friend and chess-playing buddy Michael Auger was also a strong junior player. They started organizing more regular chess events on campus and, in true fairy tale style, stumbled onto a diamond in the rough. Xin Luo, a foreign-exchange student from China, came to an event one day and started beating everybody he faced, including Rosen and Auger. “He’s kind of our MVP,” Rosen said. Luo competed at the top level when he was younger, but he stopped playing chess when he was 11 to focus on school. He has been regaining his form over the past two years after an eight-year hiatus and is a key component to the Fighting Illini’s success. The team’s fourth board, Akshay Indusekar, didn’t start playing chess until high school, which in the chess world is an incredibly late start. “He’s one of those players that just got really good, really quickly,” Rosen said. Now the club meets twice weekly, once for the general student population and once for the chess team, and the players serve as their own coaches, helping one another with game analysis and opening preparation. Although the Pan-American is open to any post-secondary school in North America, South America, Central America or the Caribbean, only a handful of universities participate. Of the 42 teams took part in this year’s event (teams are made up of four players apiece), only 23 schools were represented. The St. Louis area had seven teams competing this year, including one from Washington University and three each from Lindenwood University and Webster University, respectively. The complete list of schools and final standings from the event can be found here. Webster’s top team features two players in the top 50 in the world (Le Quang Liem at No. 48 and Wesley So at No. 28) and one player, Ray Robson, in the top 10 in the U.S. Comparatively, Rosen ranks No. 6,028 in the world and Auger places No. 18,794. At last year’s Final Four, the Fighting Illini finished last with just 2.5 points, but Rosen said they actually performed better than expected considering the huge rating disparity between teams. In April they’ll be battling UMBC, Webster University and Texas Tech for the President’s Cup. Rosen and his Fighting Illini teammates hope they can turn in one more fairy tale performance before the clock strikes midnight and the magic runs out. Note: Mike Wilmering is a 2006 graduate of the University of Missouri at Columbia School of Journalism and serves as the communications specialist for the Chess Club and Scholastic Center of St. Louis. Santa Claus is, almost certainly, a chess player. I can’t make that statement with absolute certainty as I’ve never actually witnessed the big guy over the board, but all the telltale signs are there. Who but a chess player could lay out such a carefully detailed plan of attack and, as far as I can tell, execute flawlessly year in and year out with nary a blunder. In fact, a 1908 column by Russel Ramsey in the Philadelphia Sunday Item claims to be privy to a game played by the jolly old fellow himself. If St. Louis is etching its name on the list of emerging chess capitals of the world, then London is already firmly established. And the letters are in bold print. The 5th annual London Chess Classic concluded this past week, and the marquee event featured a 16-player rapid tournament showcasing the world’s elite.